1 mother | This Blog Rules | Why go elsewhere? It was at Thailand’s Samut Prakan Crocodile Farm and Zoo when something adorable yet bizarre occurred. 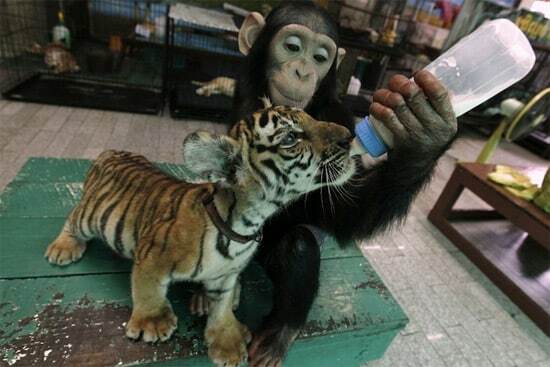 At the resort, which is 25 miles south-east of Bangkok, a two-year-old chimpanzee was feeding a baby tiger, named Aorn, from a bottle of milk. The female chimp, named Do Do, looked like a real mother to the tiger cub nestling in her arms.